About five hundred displaced Tamil voters of Thennamaravadi village, seventy-three km off north of Trincomalee town Sunday returned to their temporary residence Ponnagar in the Mullaitivu district in the LTTE held Vanni region, after voting in the Friday poll, sources said. The villagers were denied their right to vote for the last two decades. 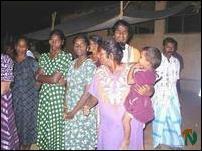 "All of you have come and exercised your franchise with the hope that you could permanently return to your village with the establishment of the Interim Self Governing Authority," newly elected Trincomalee district parliamentarians Messrs R.Sampanthan and K.Thurairetnasingham said bidding farewell to Thennamaravadi IDPs who had been staying in Nilaveli government Tamil school Saturday night, since their arrival from Vanni on Thursday. 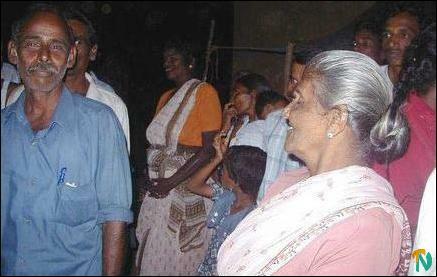 The entire Thennamaravadi village, which is located on the border of two districts Trincomalee and Mullaitivu, fled through jungles by foot to Vanni region leaving their cattle and other properties when a group of soldiers of the Sri Lanka Army forcibly entered the village twenty years ago in 1984. 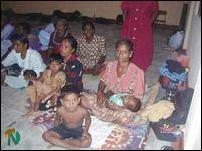 Since then they have been living in Mulliayawallai village in the Mullaitivu district establishing a temporary settlement named "Ponnagar." During the election campaign, Mr.Sampanthan and Mr.Thurairatnesingham went to Mulliayawallai and visited the "Ponnagar" settlement and requested them to come and exercise their franchise in Trincomalee district to ensure a convincing victory for the Tamil National Alliance. These IDP voters were brought down by buses from Ponnagar two days ago the Friday poll and were given accommodation, food and other essential facilities in a school in Nilaveli village. They were taken to Thiriyai village where clustered polling stations were located. They came with their families, sources said. The main objective of the ISGA is to reconstruct the war ravaged traditional Tamil villages in the northeast and to rehabilitate the hundreds of thousands IDPs who have been languishing in refugee camps and welfare centres," said Mr.Sampanthan addressing the Thennamaravadi voters. "You could return to your village once it is reconstructed," he added. Mr.Sampanthan told Thennamaravadi IDPs that ISGA would be established shortly in the northeast to reconstruct and rehabilitate the war-ravaged northeast and no forces in the south could deny this any more. 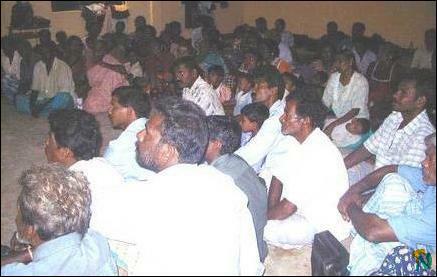 The IDPs expressed their eagerness to return to their own lands in Thennamaravadi village.